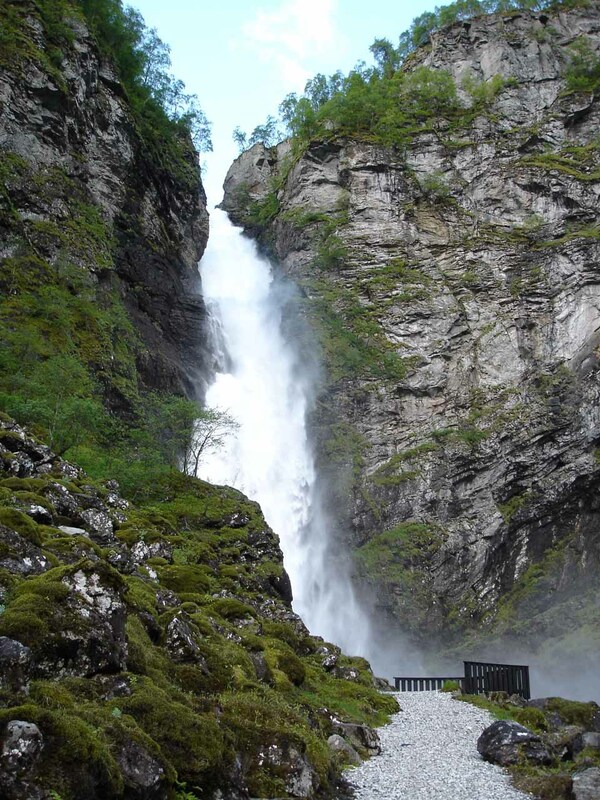 Stalheimsfossen and Sivlefossen were two giant waterfalls tumbling on opposite sides of the serpentine road known as Stalheimskleiva. 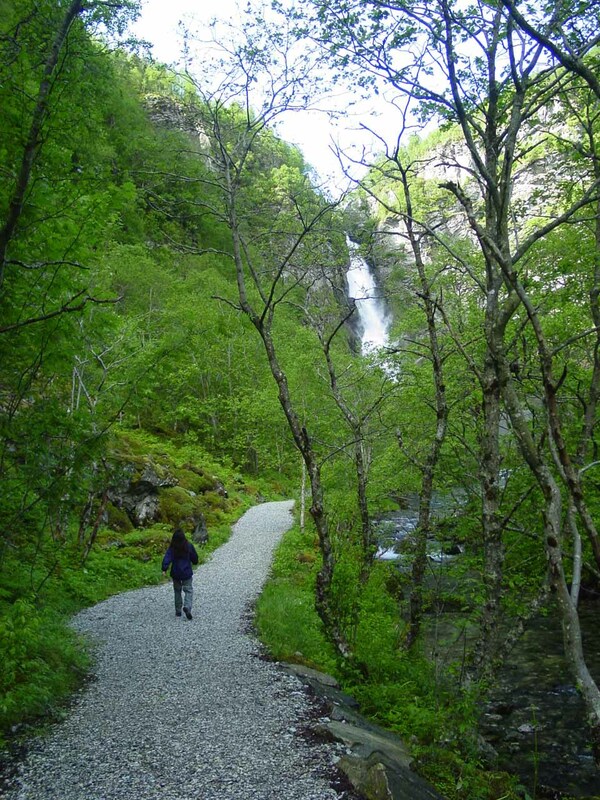 In addition to the waterfalls, there was a lot of scenery packed into this tight area around the serpentine road itself. 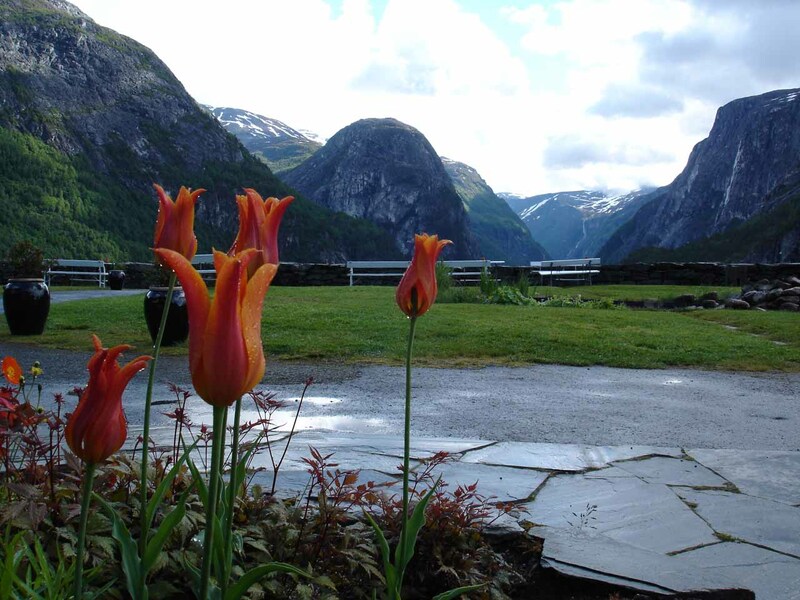 At its top was the Stalheim Hotel, which seemed to be a pretty neat place to stay as it featured precipitous views towards the precipitously narrow Nærøydalen Valley, especially from the property’s terrace. 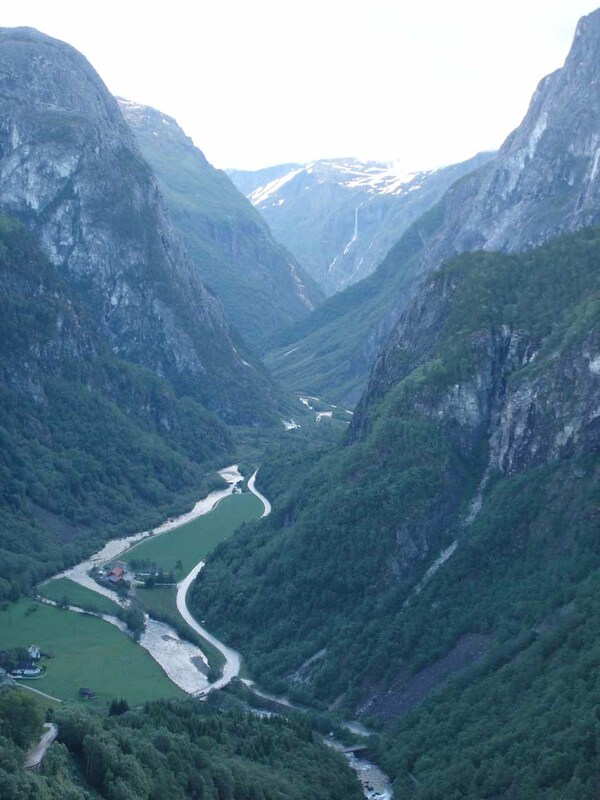 That valley sat at the bottom of Stalheimskleiva, but it was also important as it was accessible to the two wildest of the fjord arms belonging to Sognefjorden – Nærøyfjorden and Aurlandsfjorden. The relatively untouched scenic allure of those fjords earned them UNESCO World Heritage status the same year as our visit in 2005. 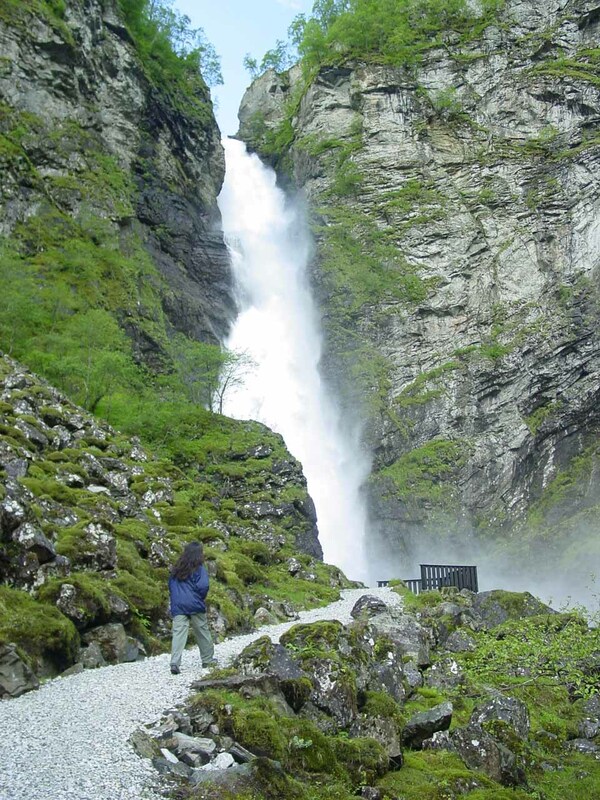 Indeed, it was almost as if these waterfalls were merely waterfalling excuses to experience one of the top attractions in Norway! 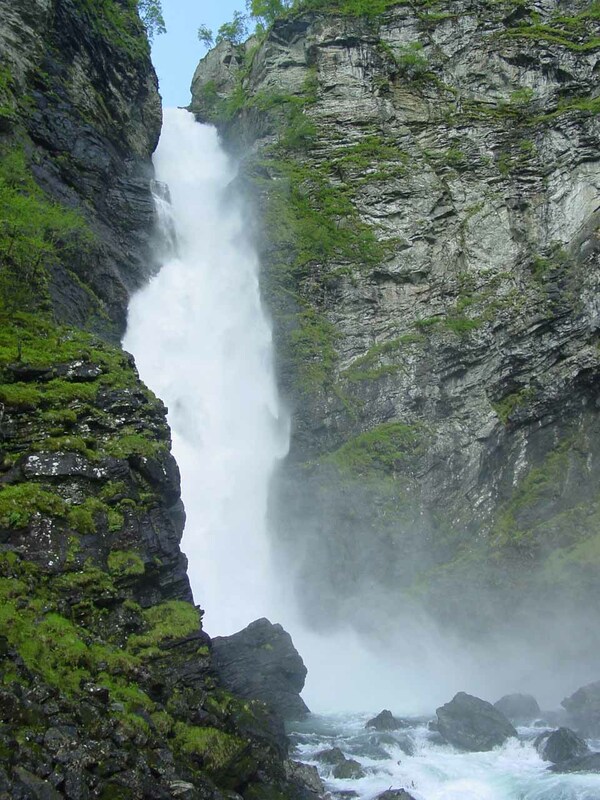 Of the two waterfalls, it was Stalheimsfossen that was the more well-known of the two, but Sivlefossen was nearly equally as big and voluminous. 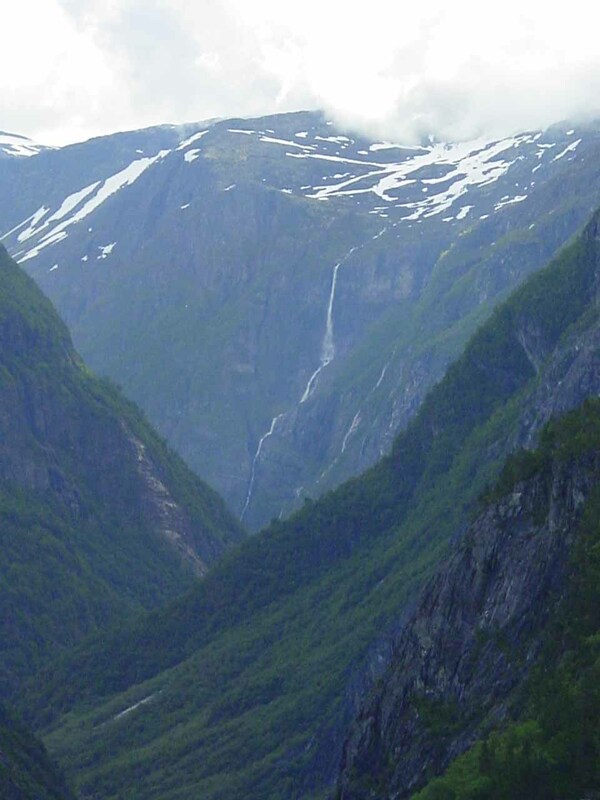 Both waterfalls were said to be 126m and 142m tall, respectively. 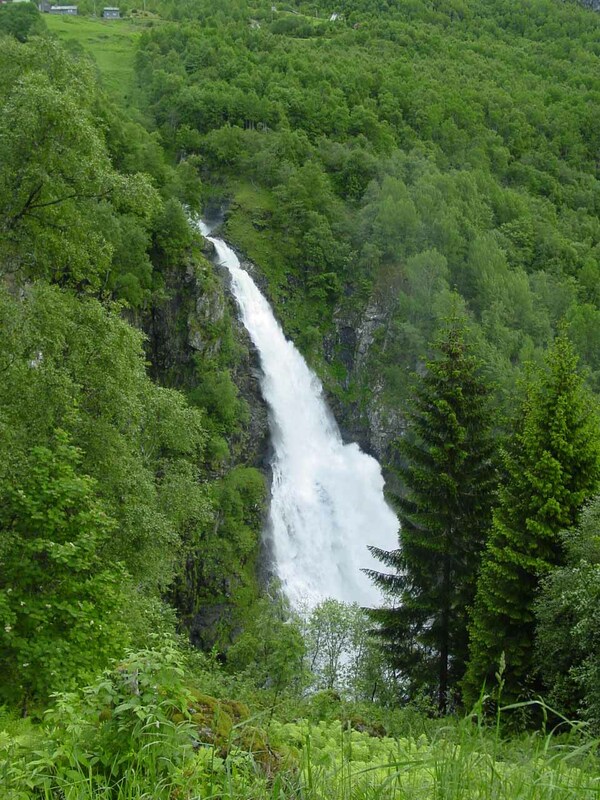 We really weren’t able to see the waterfalls in earnest until we were on the serpentine road itself. 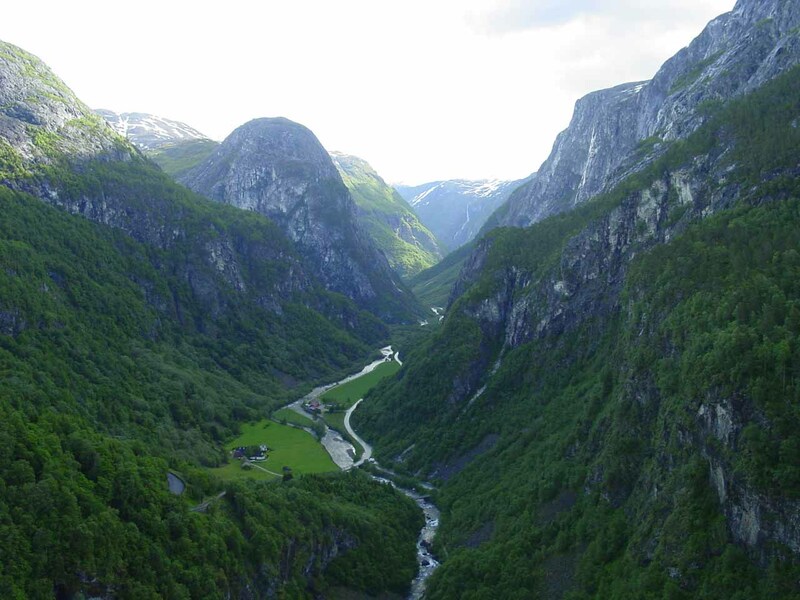 However, since we weren’t used to such narrow and steep winding roads at the time (driving a stick shift, no less), we were a little nervous about wearing out the brakes while being so close to the dropoffs as we gingerly descended the 13 switchbacks. With such limited space to pullout and better enjoy the views along the way, it got me wondering whether we would have been better off riding a bike (with good brakes of course) or walking the 2km in each direction. 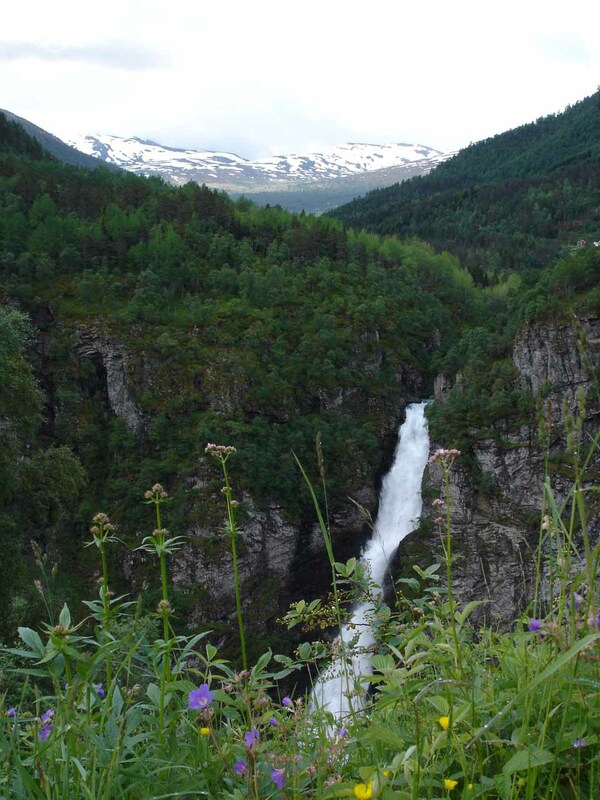 As far as we were concerned, we thought the best view of Stalheimsfossen probably came from about the third or fourth hairpin from the top of Stalheimskleiva. Again, with such limited space to pullover and get out of the way of traffic, we really had to improvise by finding space to at least allow other traffic to pass. We were also fortunate that the road was not too busy during our mid-morning visit. 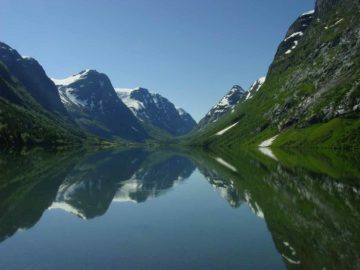 Meanwhile, around the half-way point of Stalheimskleiva, we took advantage of a pullout that yielded perhaps our best view of Sivlefossen while on the serpentine road. 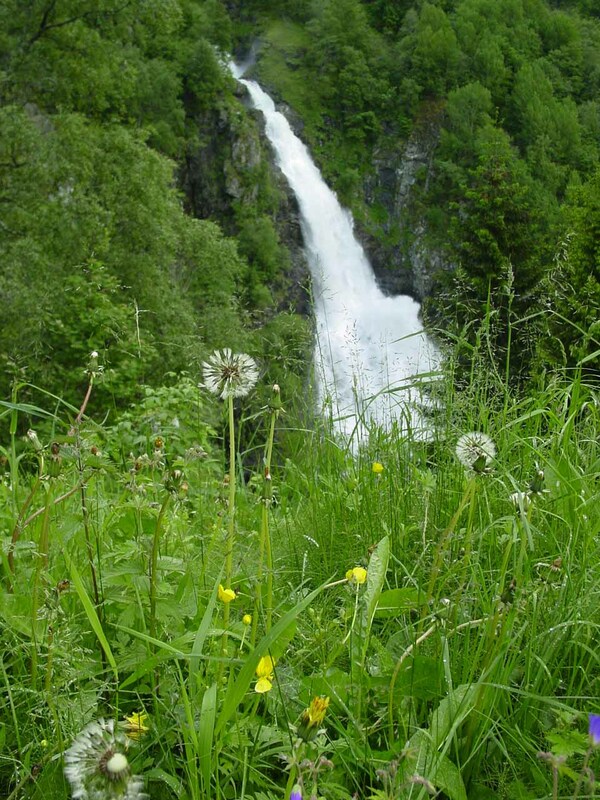 There were a few other views of this other waterfall along the road, but none were as open as the one by the pullout. 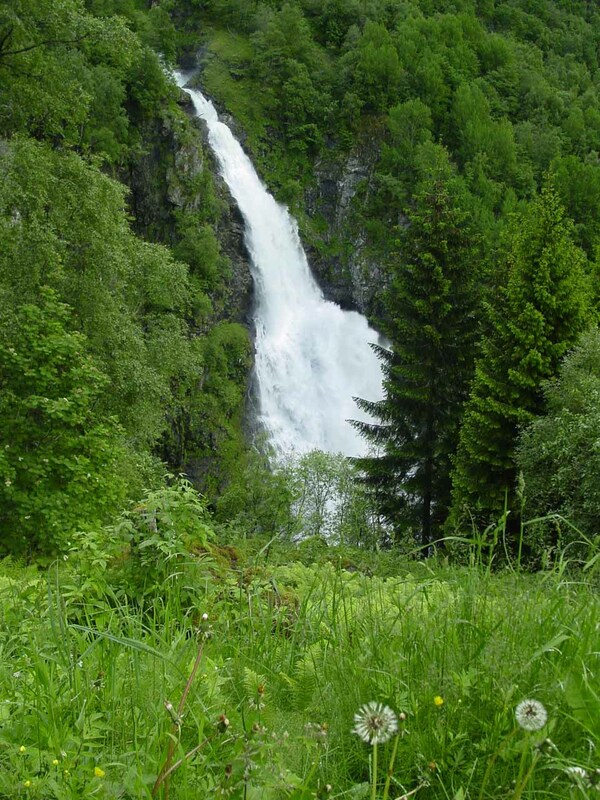 At the top of the waterfall was said to be the namesake Sivle Farm where Per Sivle (one of Norway’s most dear poets and writers) once lived. 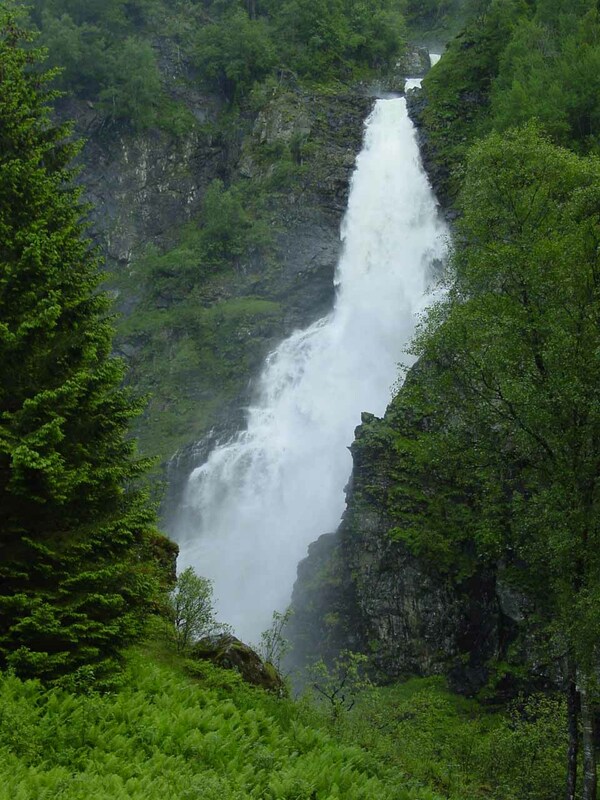 Once we made it to the bottom of the serpentine road, we also supplemented our experience of Stalheimsfossen with a short walk to its base. 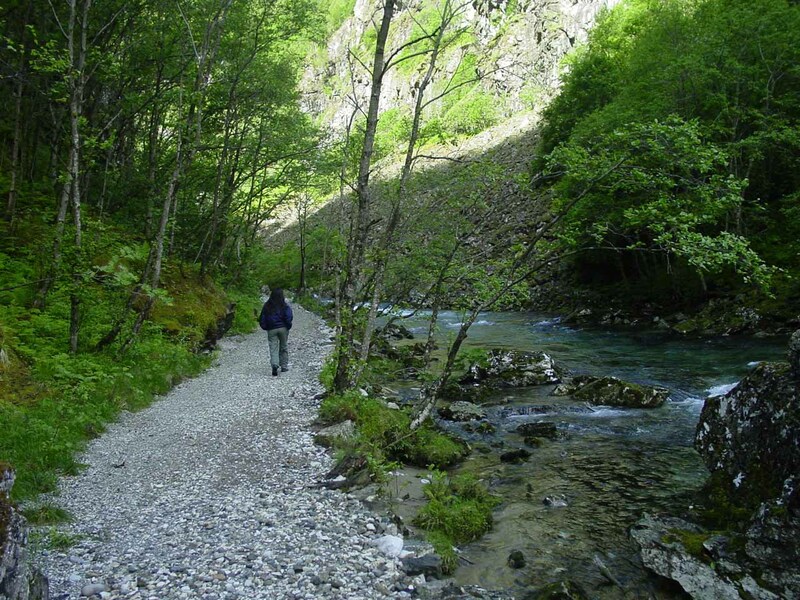 This walk was gentle and mostly flat as it followed along the Nærøy River (Nærøyselva). It was a far more relaxing experience than the thrill of Stalheimskleiva. 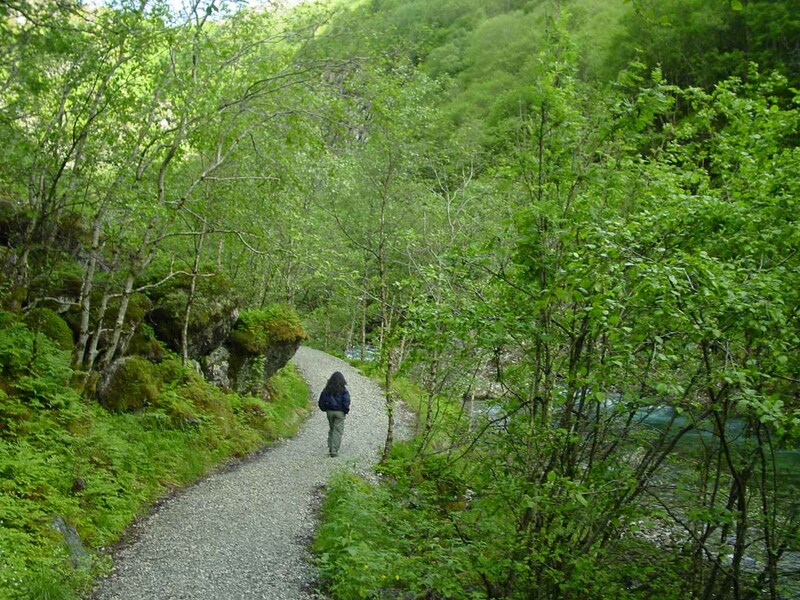 Julie and I spent a total of 30 minutes on this walk, but the time spent on this walk rejuvenated us before we would continue on with our drive through Nærøydalen Valley and towards Flåm. 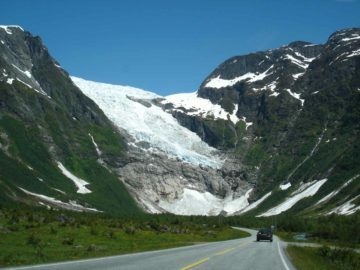 Finally, it was worth noting that the steepness of Stalheimskleiva was no fluke as it was said to be one of the steepest roads in Northern Europe thanks to its 20% grade. 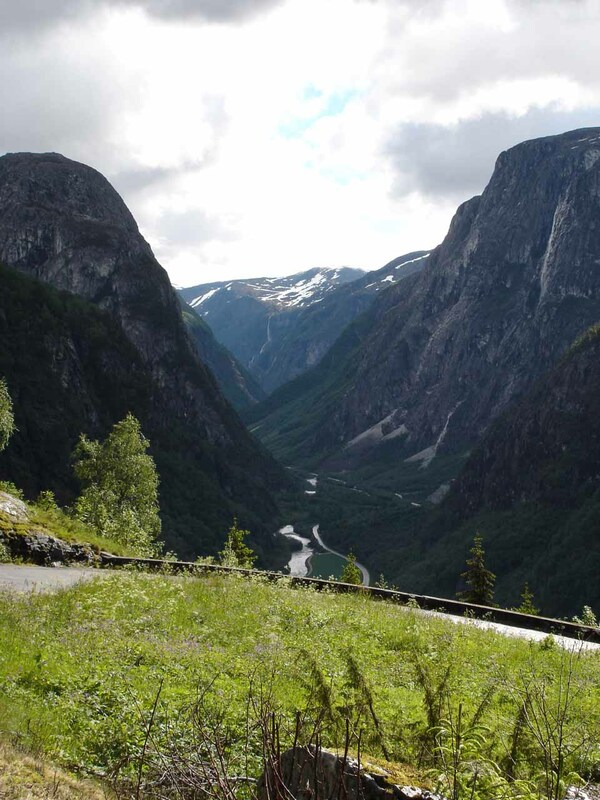 It was also the first of two famous serpentine roads we would be driving on in the country (the other being Trollstigen in Møre og Romsdal County). 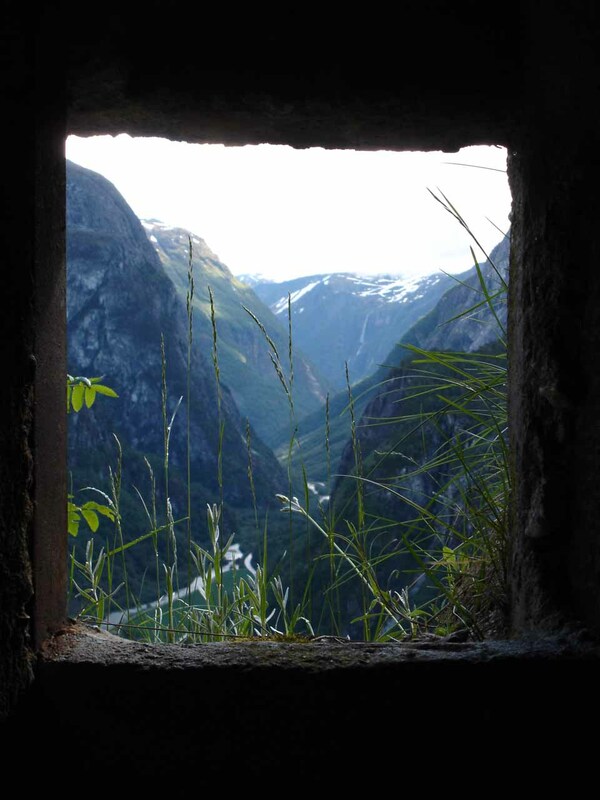 According to a sign here, Stalheimskleiva was built between 1842-1849, and it was originally part of a royal postal route connecting Copenhagen, Oslo, and Bergen. It wasn’t until the 1950s when the road was improved to allow for motor vehicles. Speaking of history, the Stalheim Hotel was said to be originally built in 1885, which Kaiser Wilhelm II of Germany would visit every year for 25 years from 1889 until the first World War. 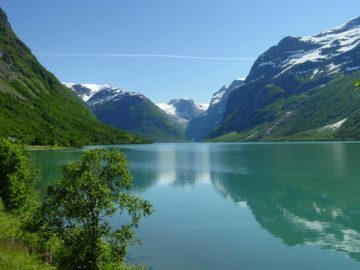 Indeed, there was quite a mix of history and scenery here, and perhaps on a return trip, Julie and I would like to take a bit more time to explore the area, especially the gazetted UNESCO fjords at Nærøyfjorden and Aurlandsfjorden. Given the somewhat close proximity to both Voss to the south and Flåm further to the east, it seemed to make sense for this place to be such a base for further exploration. 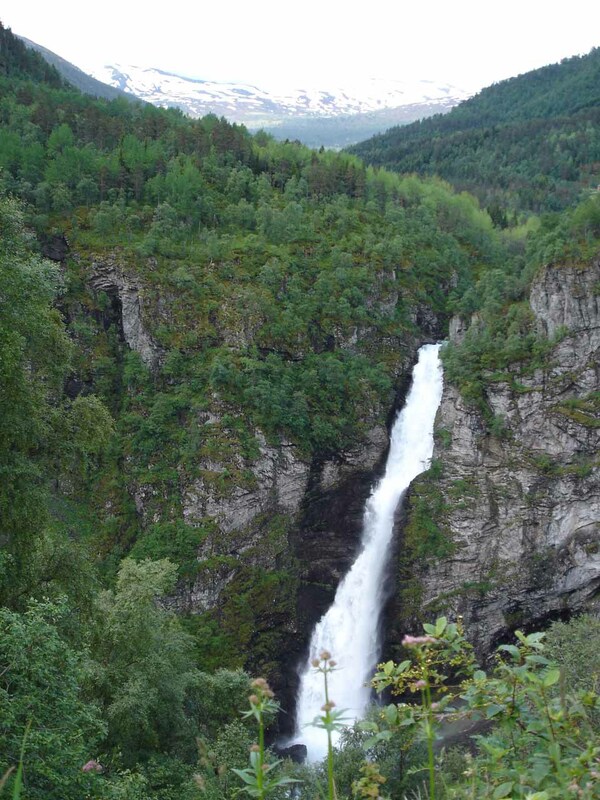 Stalheimsfossen and Sivlefossen reside in the Voss Municipality. For information or inquiries about the area as well as current conditions, visit their website or Facebook page. 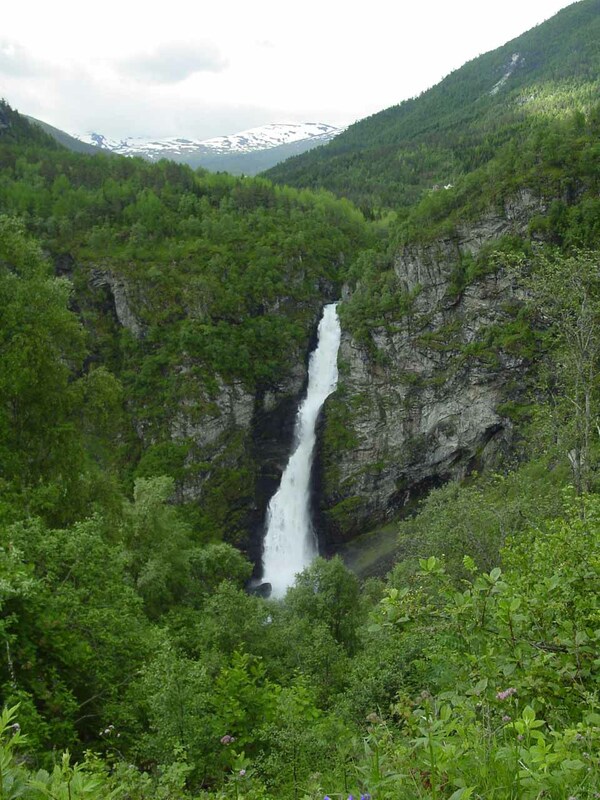 To get to Stalheimskleiva from the E16/Rv13 junction in Voss, we drove north on the E16 for about 30km. Rv13 and E16 then split up at a junction in Framnes so we continued on the E16 by staying on the right. 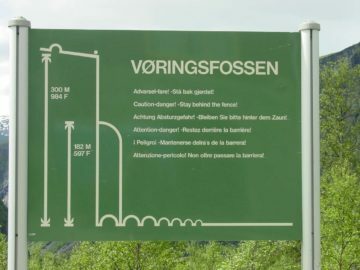 In another 5km, we had the option of taking a tunnel on E16 (thereby bypassing Stalheimskleiva) or heading towards the Stalheim Hotel where the steep road begins shortly thereafter. 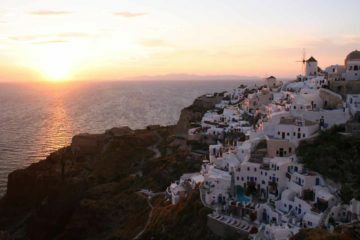 Obviously, we headed for the hotel, which was the left fork at the split. 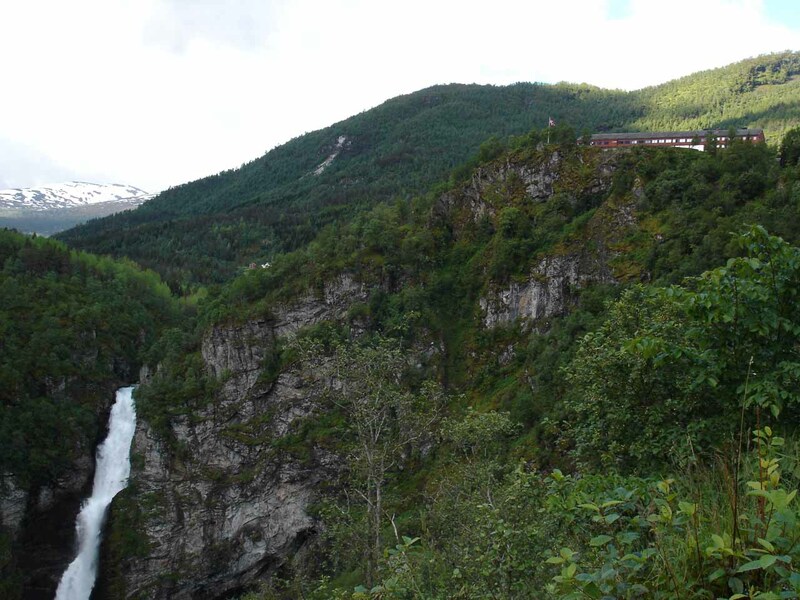 Immediately past the hotel, the E16 steeply descended 2km down the serpentine road known as Stalheimskleiva before rejoining the main thoroughfare of the E16 after passing by a small car park. By the way, that car park was the start of the easy walk to the base of Stalheimsfossen. 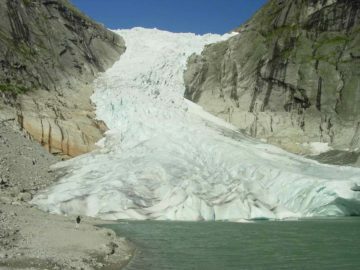 Going in the other direction, the base of Stalheimskleiva was about 29km west of Flåm at the head of Nærøydalen. 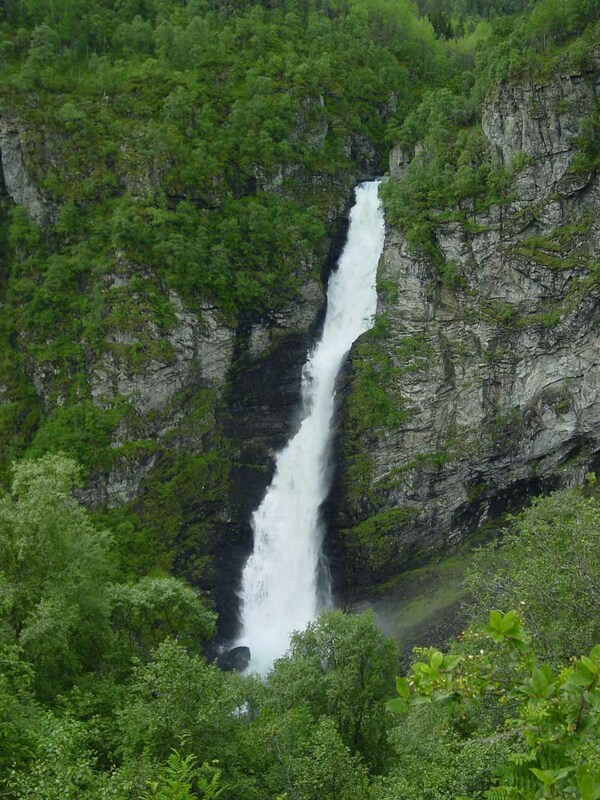 Also from the terrace at the Stalheim Hotel, we got to see the upper part of Kjelfossen, which provided us some credibility to the claim that it was one of the tallest waterfalls in Norway.